c. Degrees: It converts the radians into degrees. d.Sqrt(n): It returns the square root value of 'n'. g. Round (m,n):It will return the value of m to the nearest whole number (or) It will round the value 'm' based on value of 'n'. n- indicates number of digits right to the decimal point. Truncate is valid only in oracle but not in SQL Server. a. Ascii('Char'): It returns the ascii value of a character. b. Char(n): It returns the character for the given number. c. Lower('String'): It converts out the uppercase strings into lower cases. d. Upper('String'):It converts out the lowercase strings into upper cases. 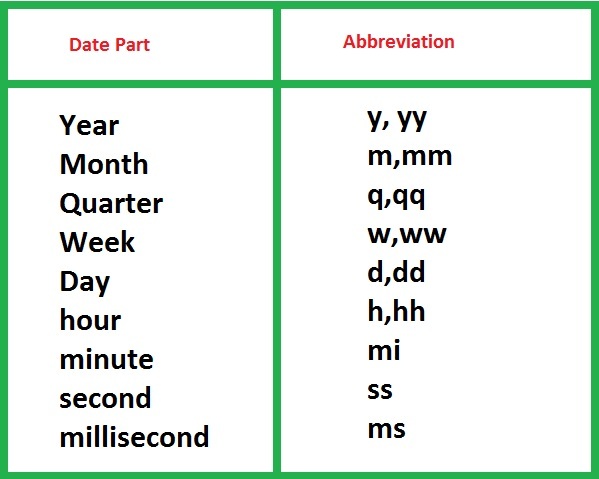 e. Length ('string') or Len ('string'):It returns the length of a give string. space also considered as character. f. Replace('string','searching string','replace string'): It will replace a sub string with another string. g. Reverse('String'):It will reverse the given string. h. Substring('String',startingposition,number of characters requried): It is useful to extract a substring from a main string. It will take entire string from 2nd letter on wards as no of character value is omitted. 1. getdate(): It returns the server or system date. sIt returns the new date value after adding 'm' given date according to datepart. 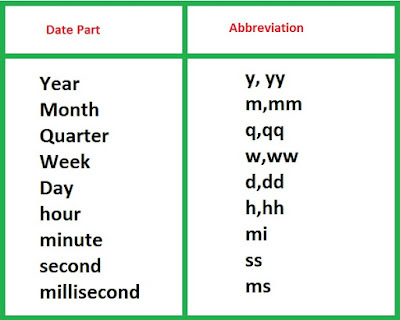 3. datediff(datepart, date1, date2):It returns the difference between the two dates according to datepart.